External bleeding occurs when the body’s protective skin is broken. In severe cases, blood loss may place the victim’s life in danger. Direct pressure and elevation usually stops bleeding, even the rush of blood from an artery. Call 911 if you can’t stop the bleeding or the victim shows signs of shock. Press directly on the wound with a clean gauze patch or cloth. Keep the pressure constant for at least 5 minutes. This allows the blood to clot (thicken), preventing additional bleeding. Don’t lift the bandage to check on the bleeding until at least 5 minutes have passed. Raise the wound above heart level, if possible, to reduce blood flow to the injury. If a bone is broken, immobilize the joints above and below the break before elevating the wound. Pinch the nostrils below the bone. 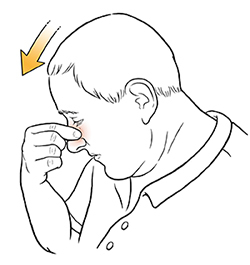 Tip the person’s head slightly forward and sit quietly, maintaining pressure on the nose for at least 5 minutes. Don’t tilt the person’s head backward. This may cause blood to run backward into the person’s mouth and throat. Don’t destroy the clot by blowing or rubbing nose after the bleeding stops. Bleeding: How much is too much? The victim’s age, body size, and overall health all help determine when bleeding becomes serious. Concentrate on the victim’s condition and appearance—not on the amount of blood lost. Watch the victim for signs of shock. If any shock symptoms appear, blood loss is a threat to life.